Elegant, metal log store. 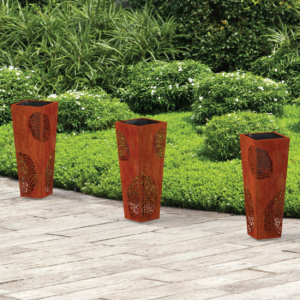 Featuring delicate leaf design and shelves for easy sorting and storage of firewood. Please ensure a material and a colour are selected. 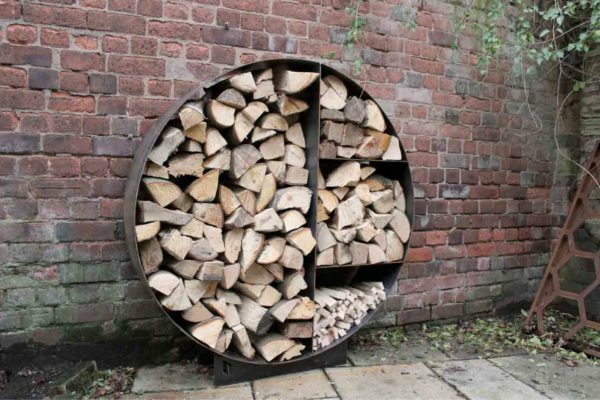 This large, metal log store is the perfect solution to bringing your firewood nearer to the house, without having to compromise on style. The shelf sections allow you to better organise your firewood by size and the open sides will allow for adequate airflow, to help the logs to dry thoroughly. 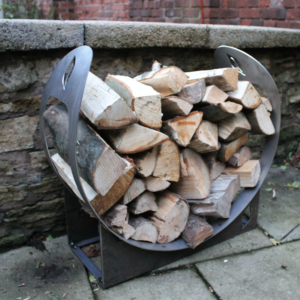 The circular section provides plenty of space to stock up on firewood for cold nights! The sturdy base features our signature leaf cut out, but, we can easily change this for your family name or other design of your choice. Simply visit our contact page and let us know your idea and we will process this as a bespoke order for you. If you order this item through check out and we don’t hear from you within 24 hours, your log store will come as seen here, with our leaf design. The images featured here are how your log store would look upon arrival, should you choose Corten or Mild Steel as your material. This will then rust to generate a unique patina, based upon the conditions and environment it is kept in. Be sure to read our finishes guide to ensure you get the material and finish perfect for your space. All Corten and mild steel products will be delivered un-rusted. 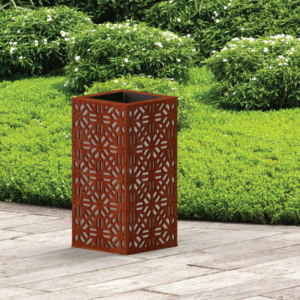 The metal will naturally rust when exposed to natural elements, giving each product a unique patina. 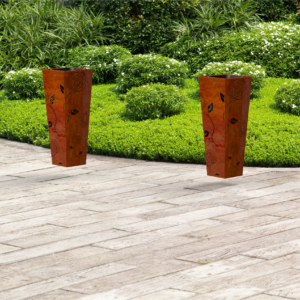 Corten or untreated mild steel can contaminate the soil and make it difficult for plants to grow in this area. The rust colour may be carried by the rain and ‘bleed’ to the surrounding area. Every product is made to order and so the exact finish, colouration and design may vary slightly from the images shown here, on the website. The safety of our products is of importance to us and a reasonable effort has been made to smooth sharp edges and create a safe design. Due to the nature of our products, we cannot guarantee all hazards are eliminated and so we advise that young children are carefully watched when near Exteria products. We do not take liability for any losses or damages relating to the use of our products. Please see our Terms and Conditions at the bottom of the page for more information.